I wanted to share a meal I had recently with you all. 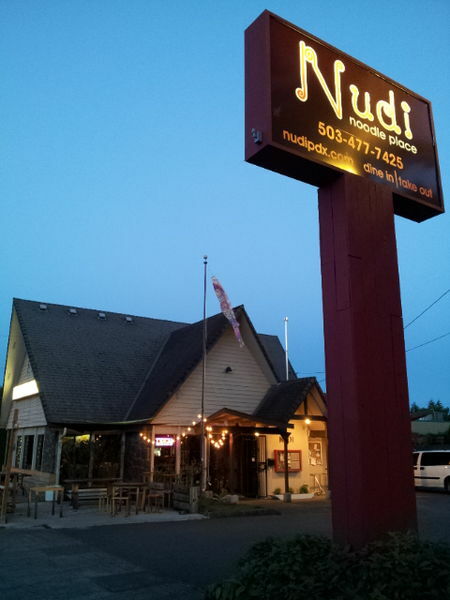 If you live in the Portland area and are looking for a delicious, affordable meal, check out Nudi in Woodstock. Nudi is a place I’ve wanted to try for awhile but things just got in the way of those plans. Recently I was meeting a friend for a pedicure at a fantastic place in Woodstock, Pure Nail Bar, and we decided to meet up for lunch first. I had assumed that Nudi was a noodle/ramen/Pho type of place but it was a lot different than I expected. First, the inside of the restaurant is super classy looking and decorated nicely. The outside of the restaurant looked kind of dumpy and run down but once you are inside it’s very nice. Don’t let the exterior scare you off. Second, the menu is large and diverse. 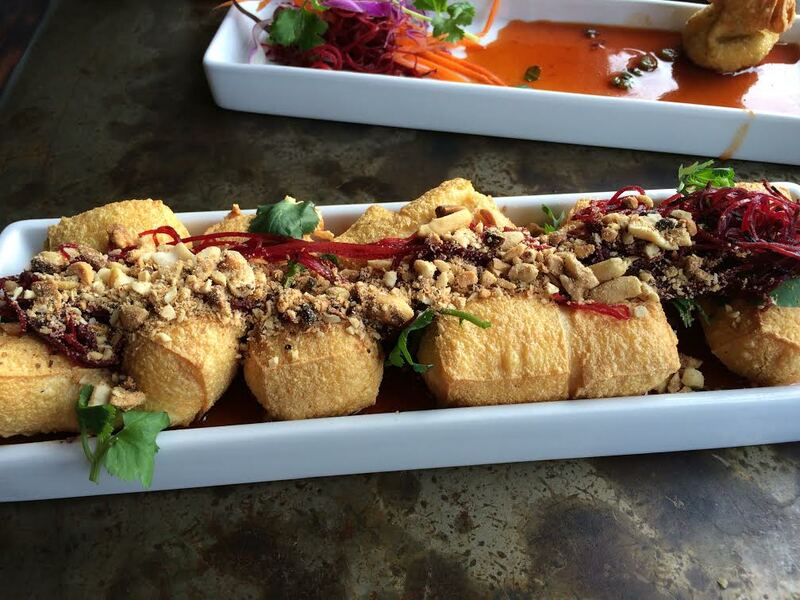 If you aren’t feeling noodles, there’s tons of other options including lots of vegetarian and vegan options. There were also many gluten free options. 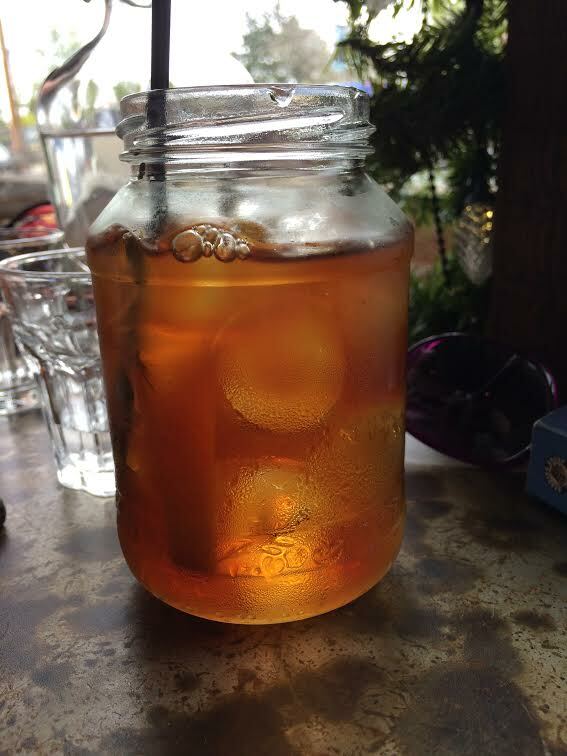 I got their iced tea to drink and it was the best iced tea I’d ever had. I have no idea what kind it was; the flavor was subtle and not too sweet and it had a slice of orange in it. My friend Star met me for lunch and we decided to order a few appetizers and share them for lunch. The first was the Asado Bun. 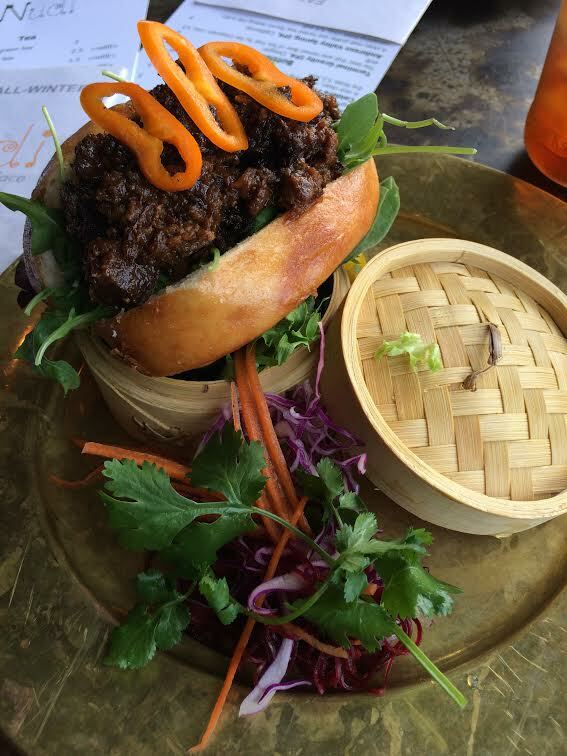 I imagined it being a small bun, like a bao bun but it turned out to be huge! It was fried bread with sweet pork belly, lettuce, red onions, jalapenos and herbs. Star and I split it. The pork was melt in your mouth soft and super sweet. So flavorful! Next up Crab Rangoon. 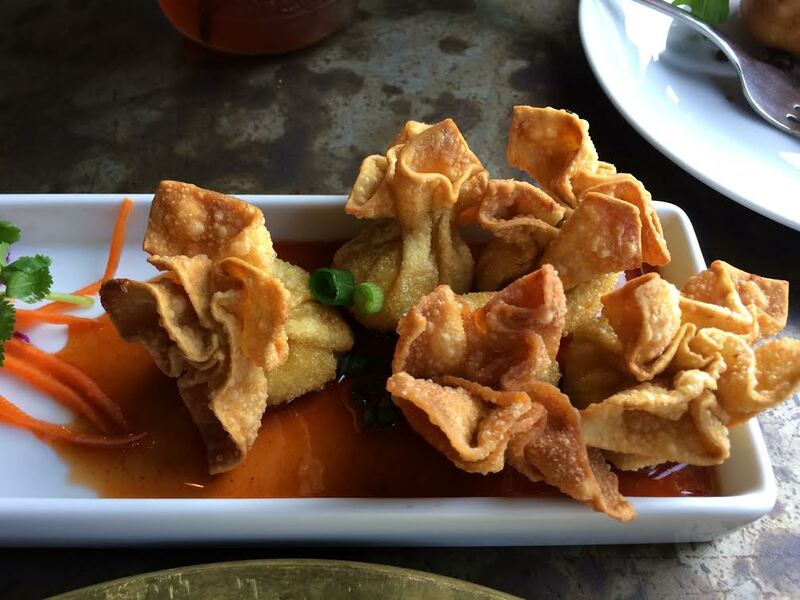 It had Dungeness crab meat stuffed in wontons with cream cheese and a sweet & spicy dipping sauce. These were to die for. I rarely eat fried foods so this was a real treat. I’d say this was the favorite dish for both of us. We decided to splurge and share a dessert. We ordered the Pumpkin Flan. It was gluten free and it came out looking like a work of art. 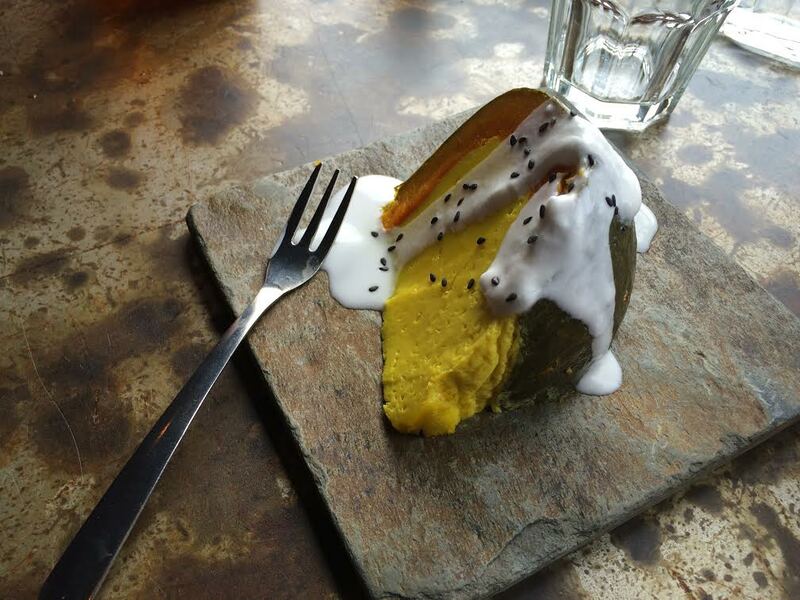 It was steamed pumpkin with coconut milk flan and coconut sauce. It was the texture of flan/custard and it wasn’t sweet. There was a hint of sweetness from the coconut and pumpkin but it was barely there. It was a very unique flavor and it felt like a healthy treat as opposed to a huge calorie bomb like chocolate. It came in the pumpkin skin and you just scraped it out of there. We shared the dessert and it was the perfect amount for the two of us to have a treat. A few weeks later I met my friend Robyn here for a lunch date! Once again, got the amazing iced tea and we both ordered a soup. I got the Tom Yum Ramen. It came with ramen noodles, beef, veggies and an egg. I’d been craving Ramen (like real Ramen, not the 59 cent package!) and this hit the spot. 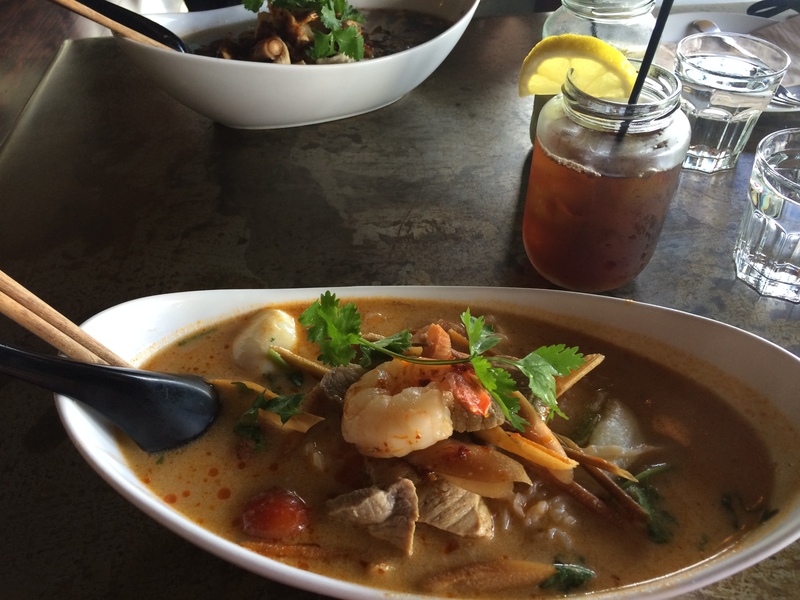 I’m a huge fan of Tom Yum soup, so this was good. The only downside was that the ramen noodles were really soft. I would have liked them a little more well-done I think. Other than that, it was tasty and a nice lunch date with my friend. wahh-wahhh. Now I want to go to Nudi. You always be posting ‘da good stuff that I be jealous of. That soup looks amazing!! Yum.